I am officially Omaha bound in about 5 hours, I can barely contain my excitiment! Can you blame me? I am so close to seeing my family and celebrating my lovely sisters 21st birthday! I can't think of a better way to spend a weekend! Pitch Pizza, an out door concert, my favorite cinnamon rolls from Wheatfields! And of course a few Omaha bars to celebrate her big birthday! Can I leave right now? Its going to be a weekend of laughs, celebration and good quality family time! Now lets talk about this weeks pin recipe! 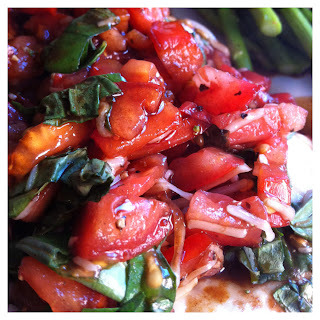 Grilled Burschetta Chicken - From the Girl Who Ate Everything! Super easy! I did not grill my chicken, I baked it. However the end result was still delicious! I let my chicken marinade all day, and I thought the tomato/burschetta topping on top was delicious! A quick and easy meal that won points with my taste testers! 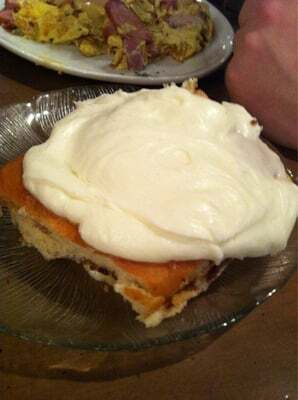 This recipe will be made again! Well folks I am out! Have a fabulous weekend, I will see you Monday with a little recap from our Omaha weekend! Can we just talk about that cinnamon roll for a minute? OMG girl that looks to die to DIE for!